The property expert turned everything expert, Kirstie Allsop, has recently opined that it’s not worth girls going to university as they should just get really well paid jobs aged 18 and buy themselves some property in order to be in a good position to bag a boyfriend and birth a baby aged 27. 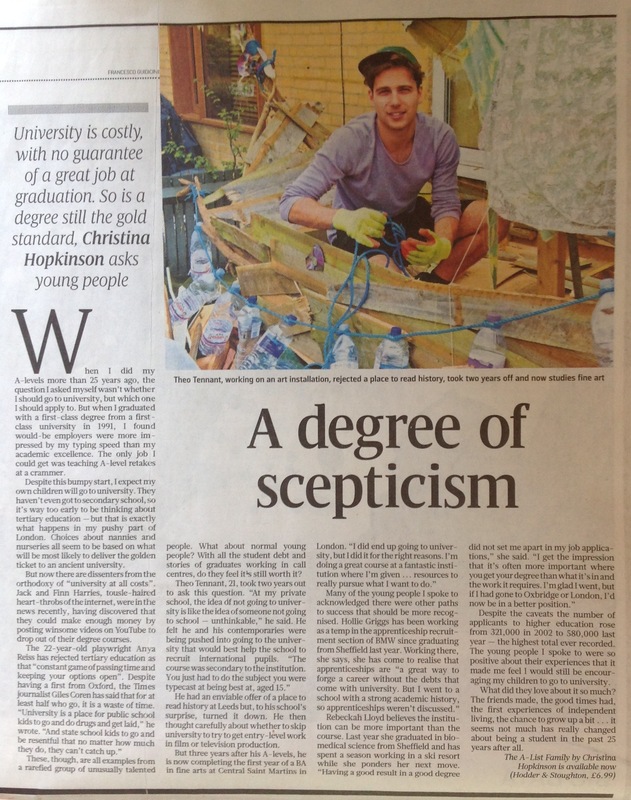 By coincidence, the Sunday Times published a piece I wrote about whether, in these days of fees and a dearth of graduate jobs, it’s still worth going to university. Here‘s a jpg (a bit wobbly) as it’s behind a paywall. Quoted and pictured is the lovely and articulate Theo Tennant, who unlike most of his peers really grappled with the question. He felt as if he were being trammelled into whatever university would look best on his school’s stats. However, after some proper reflection and inspection, he did decide he would want to go on to further education and is now doing a degree at St Martin’s. It was great speaking to lots of twenty somethings (a few who there wasn’t space to include in the article unfortunately) because it’s a demographic I don’t have much to do with generally since they’re way younger than me and way older than my children. I was heartened by how positive they were about their experiences at university and how sanguine they were about their debts. While I shouldn’t push my own children into going (and let’s face it, they’re not even at secondary education stage, let alone tertiary), the graduates I spoke to certainly didn’t put me off at the least encouraging them. Who am I kidding? I’m sure to be the most horrible pushy mother when it comes to it since I’m still stuck on university being the optimum path. For my daughters, Kirstie Allsop, as well as my son.